Pearland’s location just outside Houston means that residents can expect to see all the critters and creatures associated with the bayou, including snakes. These creatures will come into your yard and home looking for food, water, and shelter. 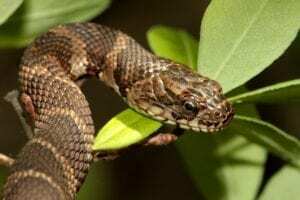 Excluding the snakes from your property is the best way to control them because some of those snake species are highly venomous, including copperheads, rattlesnakes, Texas coral snakes, and Western Cottonmouths (water moccasins). That means checking over your yard and home to ensure that what attracts them is kept at a minimum. Start with your house: Look around the perimeter for cracks and holes, especially in screens. The Houston Humane Society notes that snakes can squeeze through holes as small as 1/8 inch wide, so do not skip anything you find; the Humane Society warns that pipe and wire conduits into the home need to be sealed as well. Ensure all doors, including screen doors, shut properly and have enough weatherstripping and bottom barriers to prevent snakes from coming in when the doors are closed. If you have a crawlspace under your home, ensure that’s blocked off. Once that’s done, begin inspecting openings that are higher up as some snakes can get into trees and reach roof vents, for example. Your garage is a particular problem point. Garages usually harbor a lot of handy hiding spaces for snakes hoping to find a few rodents. All side and back doors must have adequate weather stripping and bottom barriers that are in good shape, and make sure the main garage door closes fully and smoothly. A door that moves in a rough manner can damage the surrounding structure and door-lowering mechanisms, contributing to future openings that could allow snakes in. If you see any problems with the door, call a garage door service in Pearland, TX like Action Garage Door as soon as you can. Also take time to clean up the interior of the garage. You may want to move everything you can off the floor into storage cabinets and shelves after removing anything you’re not going to keep. The fewer hiding spaces there are, the less attractive the garage will be to snakes. Once you have your home organized and repaired (or at least scheduled to be repaired), start looking at the grounds around the house. Clean up piles of debris, rake leaves, prune plants if appropriate, and re-organize any woodpiles. You may want to move firewood to a snake-proof woodshed. Mow grass and checking perimeter fences for possible access points. Don’t forget yard drainage. If you have a poorly draining yard that tends to flood or bring runoff close to your home, have landscapers fix that. Floods, even minor ones, can wash snakes toward your home. Snakes are a fact of life in southeast Texas, but with good preparation and monitoring, you can greatly reduce your chances of encountering one. If you find your garage door isn’t up to speed when it comes to snake exclusion, contact Action Garage Door for help fixing it.